Good thing potatoes stay good for a while, because I found myself with a whole bag-load of them after we went to the farm and absolutely no inspiration for what to do with them. Until Saturday came. And it was breakfast time. I used my food processor to shred the potatoes and added an onion while I was at it. The flavor of the onion in the finished batch was delicious. Plus I spruced up the mix by adding some seasoned salt and pepper, and that little bit of kick went a long way. The potatoes got nice and crispy, but you have to make sure to drain them well after shredding to remove all the moisture. Otherwise this process will be somewhat difficult. But once you get that done, your result will be an amazing breakfast. Enjoy! 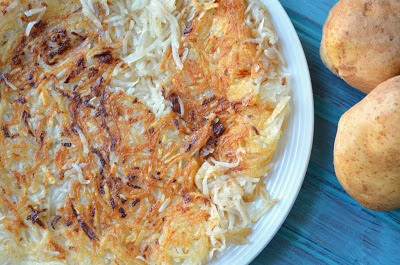 Shred potatoes and onion using a food processor. In small batches, squeeze out as much moisture as you can from potato mixture using paper towels. Set aside in a large bowl and season with seasoned salt and pepper. In large skillet, heat oil over medium heat. 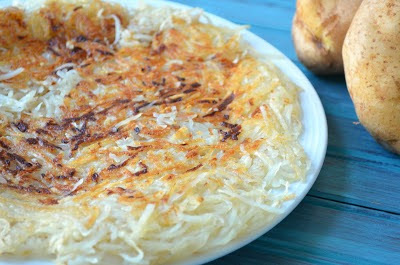 Add potato mixture in an even layer, and allow to cook for 7-10 minutes or until bottom is crispy. 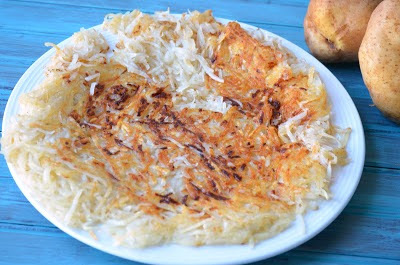 Use a spatula to flip the hash browns, and continue to cook on the other side for an additional 7-10 minutes, or until golden brown. Enjoy! Guess What We Cooked Up? ?